At the Coachella Valley Music and Arts Festival, which descends upon the Empire Polo Field here each April, there are two large outdoor stages, three almost as big stages under gargantuan tents and one enclosed nightclub-esque structure. All together, they played host to about 190 acts from Friday to Sunday, ranging from global superstars to promising indie bands that may never rise beyond that level. In the middle of it all is something called the Do Lab, a sort of temporary autonomous zone, an open-air space surrounded by conical installation art that rises 40 or so feet into the sky. 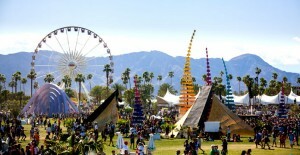 During Coachella it operates continuously, from the beginning of the day to the end, unlike most of the stages, and while a couple of well-known D.J.’s play there — their names weren’t advertised on the official Coachella lineup announcement — the mood is a little less festival and a little more Burning Man. At any given time, a few hundred people gathered there who, like the other 90,000 or so people in attendance, had paid to get in, but weren’t seeing any of the bands. Which makes you wonder: Is Coachella a festival to be seen or an experience to be had? Tickets — for both this past weekend, and the next, when the bill repeats — sold out almost instantly. So perhaps it doesn’t matter to the attendees of this destination festival — plenty dressed in hippie drag, with face paint and flower headbands — that this year’s Coachella had the least inspired lineup in years, dominated by nostalgia. Or that where it was once the essential American music festival, it has ceded at least part of that title to Bonnaroo, to Pitchfork, to Electric Daisy Carnival, to post-Coachella regional contenders like Outside Lands, the Governors Ball and Sasquatch!